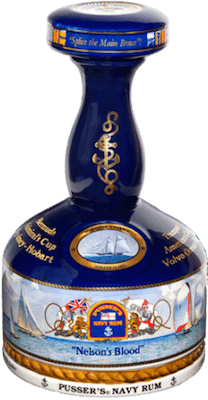 Have you found an online vendor selling Pusser's Nelson's Blood Yachting Decanter? An exceptional rum that does have some sweet notes (probably a small dosage). Not in production anymore. Really smooth and delightful. I haven't been able to find it in the decanter but that didn't change that it's fantastic. Very nice sipping rum, nice taste, not so strong for me, nice caramel and chocolate taste… and also great bottle! Bought two of these a few years ago. Polished the first off in no time and saving the second as I can't bring myself to drink it. Loved it the first time. I have the standard Pusser's Rum in my bar too. This one was purchased because of the impressive bottle. That is exactly what is of value with this rum, the bottle. After tasting it, it will remain on the shelf as a conversation piece. Great bottle. Taste has hints of vanilla, tobacco and leather. Prettig strong in alcohol but very enjoyable. This rum has clear notes of cask, tobacco and old sailboats. The taste is relatively sweet. great for sipping. Verders veel caramel en hout smaken. Niet al te zoet en een beetje droog. Lijkt wel een single malt rum. Dit "recept" rum kregen britse matrozen van 1655 tot 1971 dagelijk bij het rantsoen. veel suiker toegevoegd, ca. 40 gr/liter , punt minder. The decanter this comes in is great and has a prominent place on my shelf but was incredibly annoying to open due to a heavy wax finish. I found some good advice online (sorry can't remember where) but think I ended up melting the wax slightly with a teatowel dipped in boiling water then cutting it open and using a hoover to stop the wax going in the bottle. Not something I have any desire to repeat! The rum gives a strong manly burn and I only drink it with ginger beer when I need a break from spiced rum. When I've finished it I think I'll top it up with pusser's 15 yr old (which is a bit better than this in my mind).